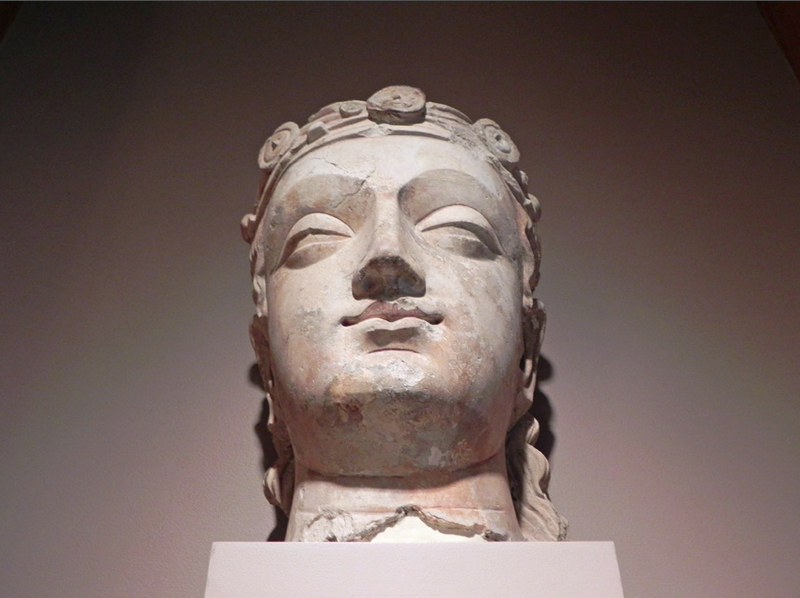 Have you ever given thought to the significance of sacred art to your spiritual practice? Why, for example, do we hang images of Christ, Mary, Shiva, or a guru in our sacred spaces? The answer is that art, especially sacred art, has extraordinary, even cosmic, power to elevate our consciousness and to raise our spiritual frequency. It touches our soul, taps our emotions and acts as a bridge to our Divine Self. Isn’t connection to a higher, purer realm and to our better, more perfect, selves what we all seek most? To this end, sacred art is a way for us to ‘call home’ and to ‘see’ ourselves home. In 2014, Clare and I wrote and presented “ARCANUM” for Gaia TV. This is the first show ever devoted to exploring the secrets of sacred art as a form of eyes-open meditation and spiritual practice. From Botticelli to Nicholas Roerich we covered a lot of ground. As we explored, all the world’s spiritual traditions tell us THE SAME THING. Our body is designed to transform into a purer or more perfect form of light capable of scaling or ascending the Ladder of Divine Ascent. As we discussed, what is required is what the alchemists and yogi’s called the Philosopher’s Stone, the Arcanum or the Chintamani (“the wish fulfilling jewel” found in the heart of the lotus). 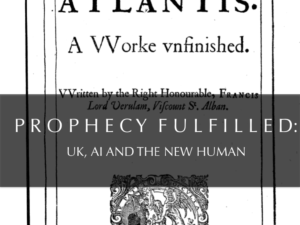 The good news is this is within us…awaiting discovery. Bodhisattva holding the triple blue dots of the Chintamani at the heart. In ARCANUM Clare and I took viewers forward a really big step toward living the art of ascension. Now, in “THE AWAKENED SOUL: LOST SCIENCE OF ASCENSION”, I take you on the next big steps in your soul’s incredible journey. As I said, the purpose of sacred art is to make present the energy of the purer realms (and the sacred entities who dwell there) and to show us the way to attaining perfection. Isn’t that the same as the ultimate purpose of yoga? A practitioner aims to perfect the asanas (poses) and transform the body into a (more) perfect state of being called moksha. The Five Principles (relaxation, proper exercise, diet, thinking and meditation) are the big “do’s” of our “perfected” or “ascended” selves. Mystic artists would say that contemplating, meditating and reflecting on sacred art is a must do, too. Sacred art feeds our imagination…and shows us the way to our next best self. In fact, as we will see, scientific evidence now says sacred images allow you to experience your divinity and even to enter the divine realm. I know this sounds kind of crazy — that sacred art acts as a portal to the Divine realm — but stretch and follow me. I promise what I am about to tell you will change your life. It may even be the basis for the ultimate yoga experience. So, our goal is to create or perfect a light body? Yes, that is what every spiritual tradition says. 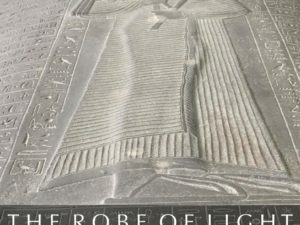 The ancient Egyptians called it “the luminous body or being” (akh) or the karast. This conception evolved into Gnosticism, where it is called “the radiant body”. In the Hermetic Corpus, it is called “the immortal body”. In the Mithraic liturgy it was called “the perfect body”. In Christianity, it is called the Resurrection Body. The philosopher Sri Aurobindo called it “the divine body,” and said it is composed of supramental substance. No matter what we call it, achievement of the light body requires that we transfigure or metamorphose our body. This, of course, is the goal of yoga. In ARCANUM, Clare and I focused especially on the icons or art of Transfiguration of Jesus into light. Soon after Jesus’s baptism by John the Baptist, during which time he acquired a glowing cloak of light, Jesus took several disciples to the top of a sacred mountain and changed his form, or transfigured, before them. His face shone like the sun. His garments became white as light. “Rise and do not be afraid”. The disciples were terrified. The reason is because Jesus transcended their beliefs. Before the Transfiguration they knew him as a human. After, he dramatically changed his appearance and radiated light. Now, they saw him as something more. They saw him as divine. Jesus told the disciples to “Rise and not be afraid.” In doing so, he invited them / us to follow his lead to Transfigure ourselves and put on the golden light body. 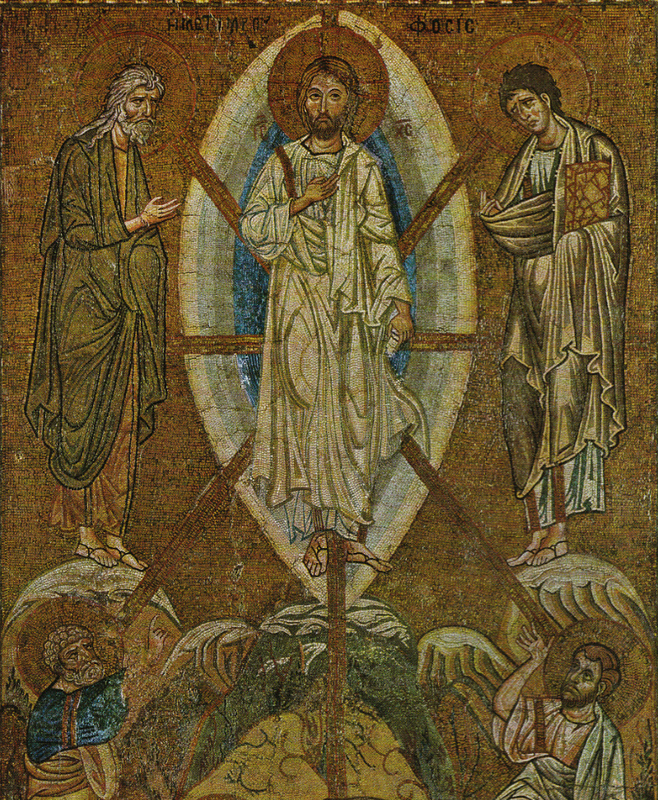 In Transfiguration icons Jesus is portrayed in front of an open gate, sometimes filled with stars, and composed of various geometric shapes, such as almond-shaped mandorlas (vesica piscis) or stars. In the every day world, when people hear the word “icon” they often think of a celebrity or a star. Iconic means very famous, super successful. Awesomer. Timeless. A brand. In the spiritual world, icons are images that function as sacred mirrors or portals to the divine. They show us the way to becoming Awesomer. Stars. Shining Ones. In the magical-alchemical imagination of the icon makers these images were designed to be actual doors to another world. Our world and “the spiritual world” are opened to each other through the icon. The icon, the image, is the meeting place between the temporal and the eternal. 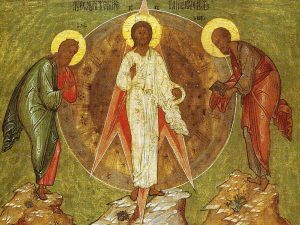 In Transfiguration icons, Jesus is meeting us at the gate. 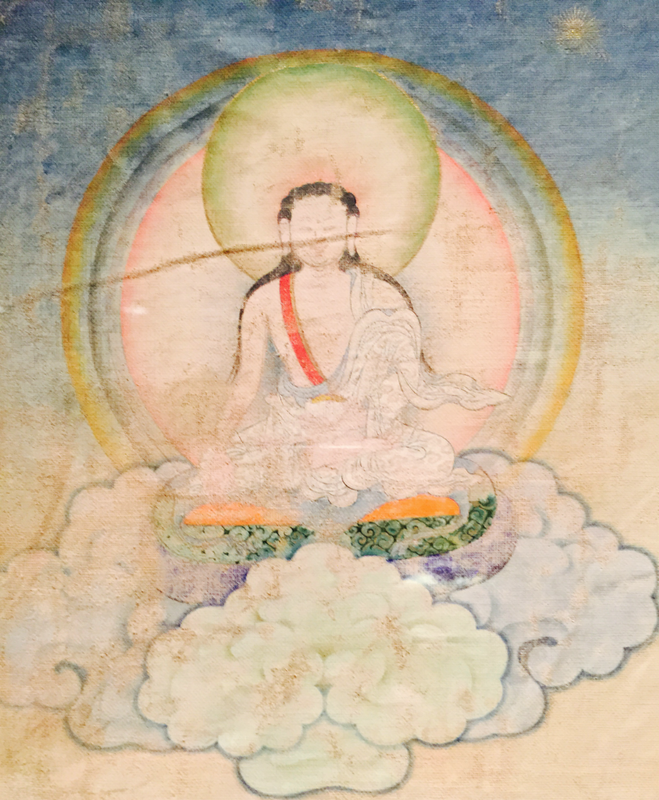 This technique applies to other gurus, especially Padmasambhava in the Rainbow Body of Light. Tibetans teach that just seeing these revered images activates our light body. As an enlightened being, Padmasambhava (also known as Guru Rinpoche) has the ability to transmit the vibration of enlightenment to seekers via his physical image, which is equal to pure spirit energy. 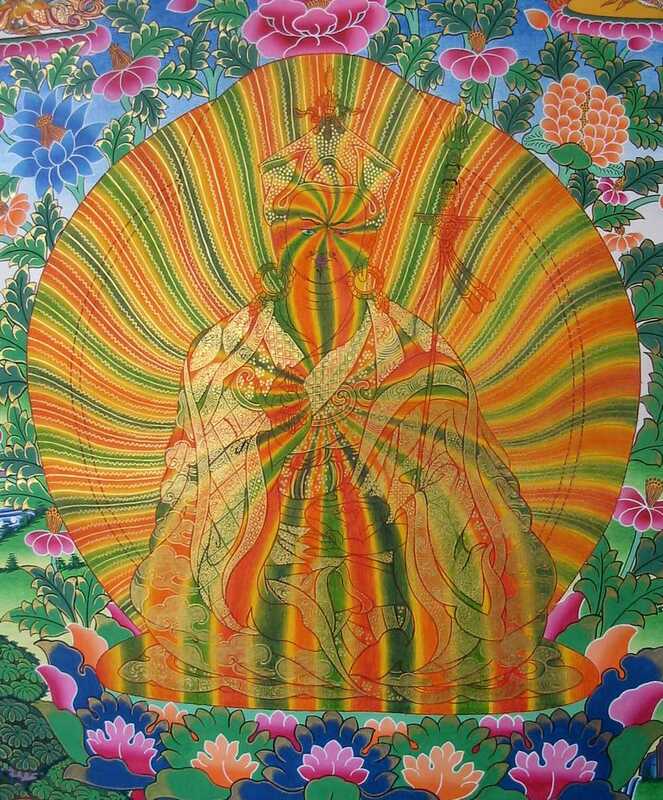 What this means is that the images of the guru in his Rainbow Body transmit the vibrations of this Perfect State. Think about what that means about he nature of our universe and the power of our soul. Hindus also worship the different Gods and Goddesses in human form. However, icons are also worshiped, which symbolize the Gods. The Shiva linga is believed to be one of the most potent emblems in Hindu ideals, which is a cylindrical or oval shaped and sometimes it is formless piece of stone or metal. That is the outward symbol of the formless being, Lord Shiva, which also signifies the philosophy of Shiva, i.e. ‘Satya’ (Truth), ‘Gyana’ (knowledge) and ‘Ananta’ (Infinity). Shiva is worshiped in his ‘linga’ form across the world, more than his human form. In Sanskrit, Linga means ‘a mark’ or ‘a symbol’, so Shiva Linga is the symbol of Lord Shiva. Like the Christian Transfiguration and Tibetan Great Perfection images, Shiva Linga symbols are a form of ‘visual alchemy’ that can help us in our transmutation (if that is your path) from lead into gold or impure soul to pure soul. Icons were specially created to enable a visceral encounter with a holy being. But, did you know that these experiences with images can also literally take you to higher levels? 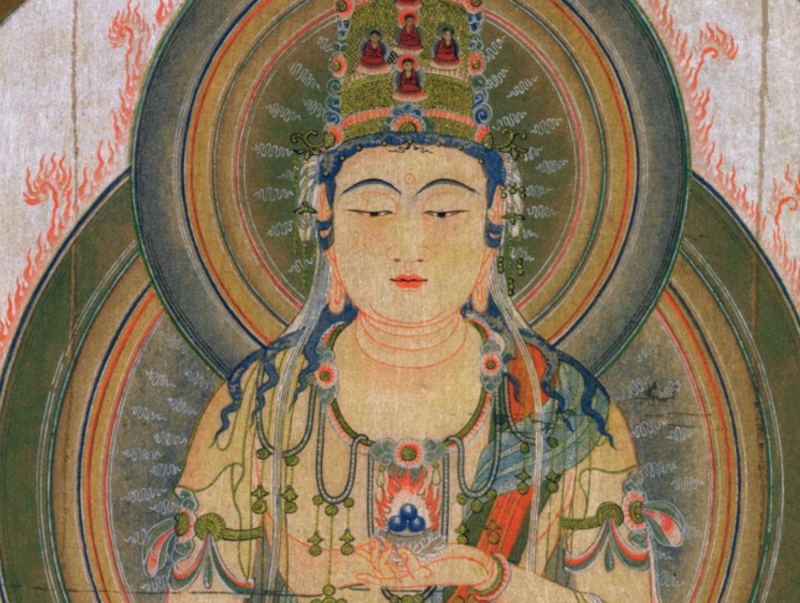 In an another example drawn from Buddhism, welcoming descent images, such as the one shown here, would be hung near the bed of the dying. Sometimes a silk string would be attached. After death, the soul would enter into the divine realm by grasping the string. When the icons were made alchemy was the normal way of interacting with the world. Everything was viewed as in the process of transmutation or changing into something else – like the acorn into the oak – simultaneously unraveling and being reborn. Everything was transmutable, including the human body, which was viewed as a ‘pupal’ form of an ascended spiritual being, usually symbolized by the butterfly (earlier by the phoenix). “There is nothing in a caterpillar that tells you it’s going to be a butterfly, “said Buckminster Fuller. There are, however, models of the ‘next human’ ‘butterfly’ that is within us. These are presented in sacred icons. A remarkable spiritual technology is active and available to us through this sacred art. 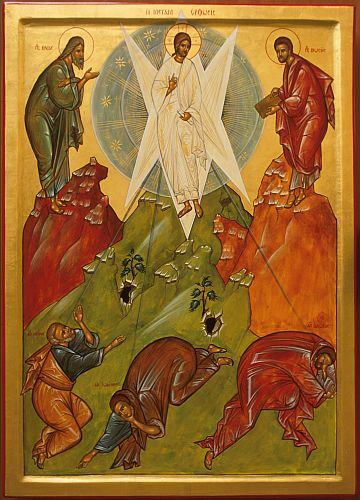 The Transfiguration icon is a (non religious) spiritual invitation for us to mirror Jesus’s transformation, to activate our latent potential, and to become enlightened ones, simply by using our imagination and reflecting what we see. This is the key benefit of the Transfiguration icons. These images were designed not just to help the early Christians to teach about the Transfiguration through pretty pictures, but also to encourage them to re-shape their lives in accordance with the hope or expectation of transforming into light (something our culture does not support). 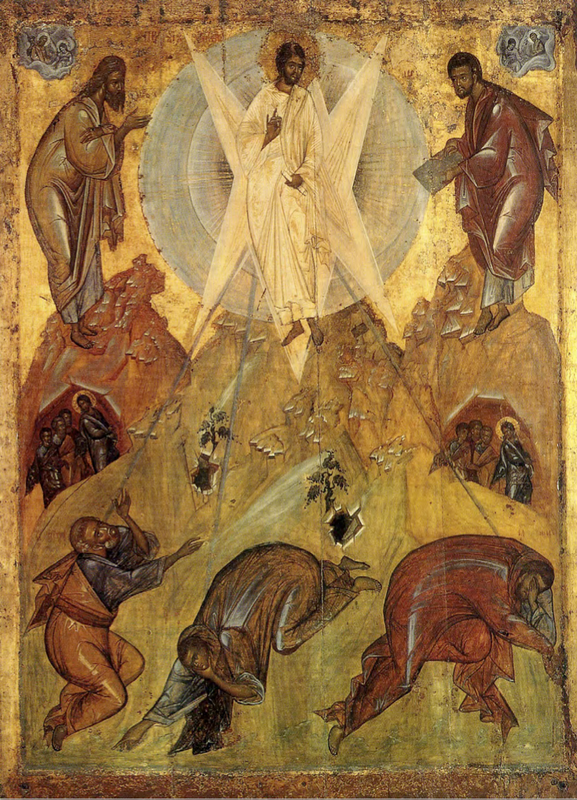 Through contemplation, meditation and reflection on the icon we begin to reflect the Light experienced by the transfigured Jesus in our lives and we, ourselves, Transfigure. This is the yoga of Transfiguration. For more on this from a yogic perspective, I highly recommend this article on transformation, transmutation and transfiguration. “Let the pose be a mirror” is a message for yogis by yogis. In yoga, the asanas are called reflections. Many yoga studios have a feature that helps to study alignment and tendencies: mirrors. This visual aid is helpful for making adjustments in our body that can take your practice to a deeper level both physically and emotionally, especially when we send the yogi in the mirror love and encouragement. In the New Testament, the Greek word “image” also means “likeness” and “portrait.” Another term we might use is “projection.” The Old and New Testament’s use the word “image” to describe all of us being in the image of the God who made us (Gen. 1:26, Matt. 22:20, Col. 1:15). We are mirror images or icons of our creator. When used as a verb the word mirror means ‘to send back’ or ‘form an image of’, ‘image’, ‘reflect’. To mirror is also to reflect (and reflection produces insight or enlightenment). A mirror does not create images it only transmits them. In a similar way, icons function as transmission devices. They are ‘stations’, ‘channels’ or transmitters of the energy of a flashy being and a higher vibration (voice or sound), the ‘ring’ of the Transfiguration that crosses time and space. Their message (programming, code) is designed to operate within the quantum human bio-computer (transfiguration system). The materials of the image become a channel or a bridge, a gate between two worlds. In fact, to an Orthodox Christian, the images are a medium through which the energy of the Transfiguration moment can be channeled, like a two-way mirror. Devotees could enter the cosmic realm through the icon. In Buddhism, we find the concept of ekagrata or ‘one pointed focus or concentration on sacred images’. 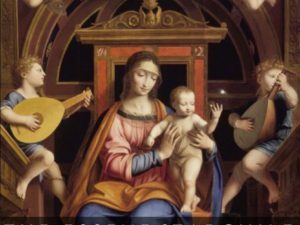 If you are deeply or single-mindedly focused on an image, there is a moment when the forepart of our brain becomes so connected that the thought you are thinking about as you look at the painting will literally become your experience. The key is to become absolutely present with the images and to identify with the sacred entity, so much so that you become one with the images, as if it being superimposed on your being and you merge with it. This is when the metaphysics of the experience turns into the physics. Our thoughts and emotions become the body. The metaphysical becomes the physical. Did you know that artists have structurally different brains compared with non-artists? A new study of participants’ brain scans revealed that artists had increased neural matter in areas relating to fine motor movements and visual imagery. The research, published in NeuroImage, suggests that an artist’s talent could be innate. But training and environmental upbringing also play crucial roles in their ability, the authors report. Dr. Mario Martinez is a clinical psychologist who specializes in how cultural beliefs affect health and longevity. He investigated alleged cases of stigmata for the Catholic Church, the BBC, NatGeo and the Discovery Channel. He has shown that a woman in California exhibited the Stigmata marks after obsessively reading about the Crucifixion. Martinez has shown that Medieval Stigmatics showed wounds on the palm of their hands because all the paintings (which were based on cultural beliefs) showed Jesus’ wounds on the palm. Then, science showed that Roman crucifixion specialists bypassed the main artery and hit a nerve in the wrist to ensure maximum agony (that lasted for days). More recent Stigmatics show the wounds in the wrist. The first person to experience the stigmata was St. Francis of Assisi, who received the wounds from the resurrected Jesus, who appeared to Francis as a Seraphim angel. The idea that a piece of art, in this case a painted crucifix, could transmit a holy message, or a sacred or spiritual energy, in this case to Francis, will later become the core idea of Renaissance art. St. Teresa of Avila claimed she received the stigmata wounds from beams of light shining from a painting of the crucifixion. Today, thanks to scholarly neuroscientific work done since the 1980s, we know more about how the brain responds to a picture than ever before. Several scientists believe that the most intriguing discovery in this field is that of the mirror neuron system (MNS). Essentially, mirror neurons respond to actions that we observe in others. The interesting part is that mirror neurons fire in the same way when we actually recreate that action ourselves. Mirror neurons fire not only when an individual performs an action, but also when the individual observes someone else make the same movement. This discovery has radically altered the way we think about our brains and ourselves, particularly our social selves. You see a person on TV get punched in the face and you flinch, ouch, in sympathy, or you flinch when you see a loved one receiving a shot in the arm and you instinctively rub your arm. Mirror neurons appear to let us “simulate” not just other people’s actions, but the intentions and emotions behind those actions. When you see someone smile, for example, your mirror neurons for smiling fire up, too, creating a sensation in your own mind of the feeling associated with smiling. This means our brain lights up when we watch some one smile, and we also feel them in our body. My question is this: when we see an image of Jesus transfiguring into light do our mirror neurons for transfiguration light up, too? 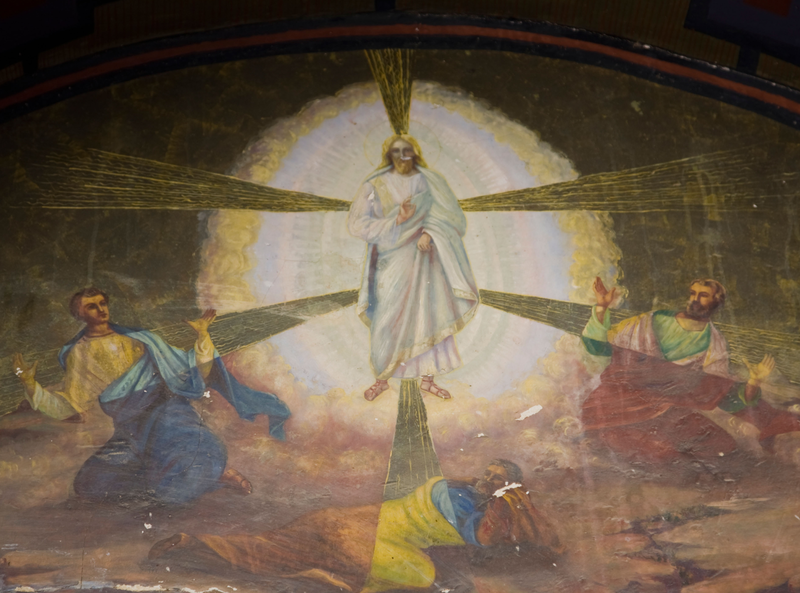 Can art of the Transfiguration affect us spiritually? I am not the first art historian or aficionado to ask this question. I am, however, the first to apply it to the Transfiguration. For centuries art theorists have commented on a number of forms of the human body engaging with works of art and being changed by them, but the exact brain mechanism that makes this possible was unknown. Dr. Francesca Bacci and art historian David Freedberg note that recent research carried out on the MNS in humans with a variety of techniques has shown that even the observation of static images of actions lead to action simulation in the brain of the observer, through the activation of the same brain regions normally activated by execution of the observed actions. There it is. Neuroscience is validating the spiritual technology of the icon makers! We can appreciate why mirror neurons are one of the most important discoveries in the last decade of neuroscience. Interaction with sacred images is a form of dreaming and rehearsal for what is to come. You are connecting your brain to a new level of mind. The quantum level. Then, you are living your life from the perspective of the soul and the light body. The images show you how the great avatars exist and our next level of being. They align us with our future selves, our future destiny. As you contemplate, meditate and reflect on the images you are retraining your brain to make new connections to your new self. As your nerve cells fire in response to the light of the images they wire together or weave together a web of light that becomes the fabric or canvas for your new body of light, your new self. As you paint this canvas you are visualizing the actual experience of the light body. You are painting a new life. Carried to the extreme in my example, just looking at an image of Jesus’s Transfiguration activates our own Transfiguration. It is that simple. This is how the lost art and science of ascension works. This is why no matter what your spiritual practice or soul advancement strategy is, sacred art can enhance your experience, performance and, ultimately, may help you create the greatest yoga experience ever. You are the first person to make me see Jesus in any legitimate way since I began questioning my Catholic upbringing as a preteen. Thank you for prompting me to open my mind. Thank you William Henry, for yor meaningful articles. There is a profound affect felt here, after reading just two. Feelings of exhileration and motivation are intensely felt now. A desire to continue on this pathless path is flaming up now!